Disclosure: This is a sponsored post on behalf of American Cleaning Institute but all opinions expressed here are mine. I LOVE DOING LAUNDRY!! My wife cannot figure out why I am enamored with cleaning our family’s dirty clothes. I tell her I have an affinity for doing monotonous chores – dirty clothes go in the washer, clean clothes come out the dryer!! The system works, and it is relatively easy!! Key ingredients for success in cleaning dirty clothes – a quality low water usage efficient washing machine, powerful dryer, potent laundry soap, and ROOM – lots of room to fold and put clothes on hangers. I am not a good role model of keeping laundry in the laundry room – I love to multitask and find myself folding in the kitchen, and making sock matches in front of the TV! When it comes to a robust laundry detergent, I lean towards the premeasured single dose packets or detergent packets. As adults, time is precious, and when it comes to laundry, convenience for consumers is paramount – a tiny liquid laundry packet (LLP) can be thrown into the wash cycle in a matter of seconds – no mess, no fuss, no spills. 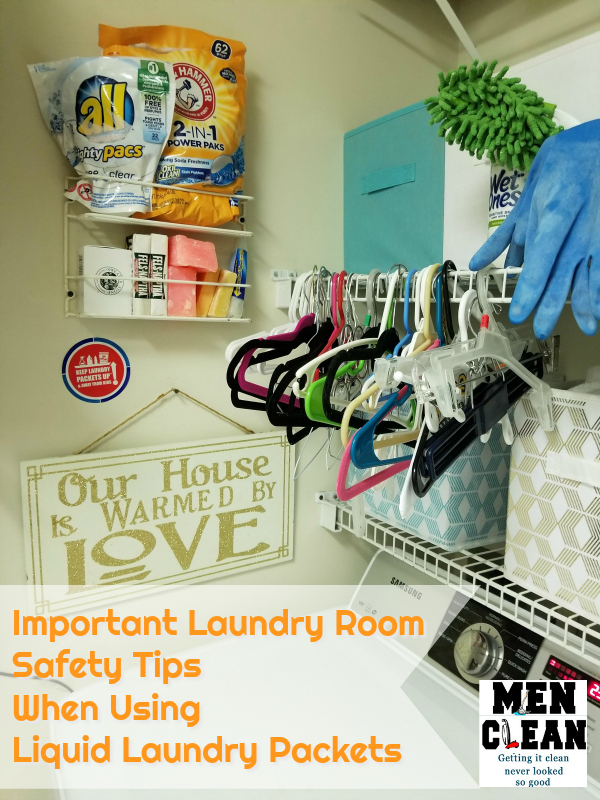 As always, at Men Clean, safety is paramount and with convenience comes care – so I always remember to put my LLPs up and out of reach from my small kids. 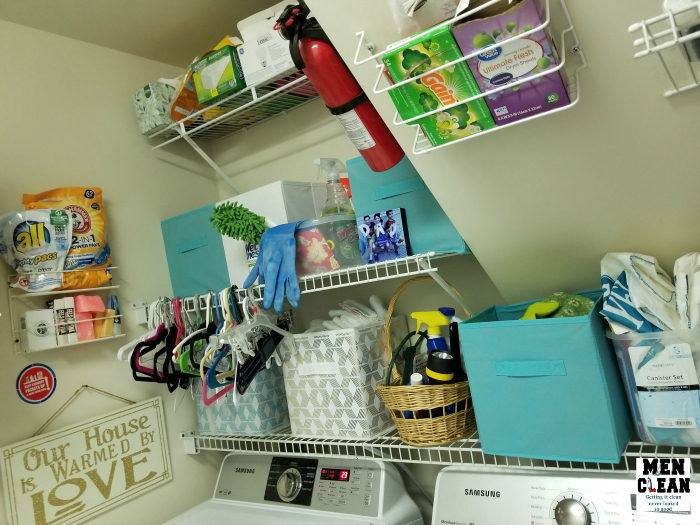 For consumers and laundry enthusiasts, let’s review how we can control our laundry room environment using a common sense approach to storage and handling of cleaning agents. PACKETS UP! Accidents can happen in an instant. Youngsters love to explore the world with their mouths. When doing laundry with your kids, they should never be allowed to handle laundry packets. The American Cleaning Institute (ACI) launched an initiative called PACKETS UP! to help parents and caregivers reduce the number of accidental liquid laundry packet exposures in children. The concept is simple, keep the laundry packets in their original sealed containers, and store the product containers in a secure fashion. 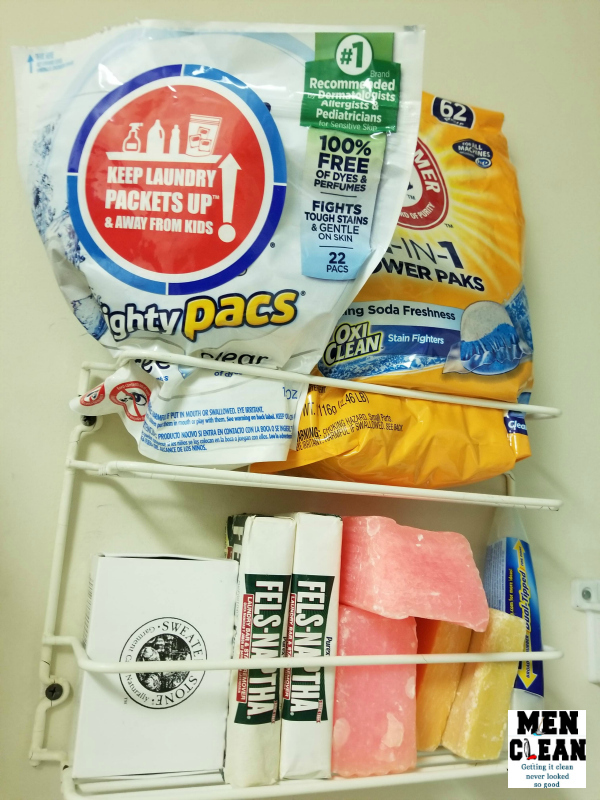 At the Men Clean household, we secure the detergent packets in a convenient storage system high above the washing machine, in neat sealable storage boxes that keep us both organized, safe and efficient in our use of space. 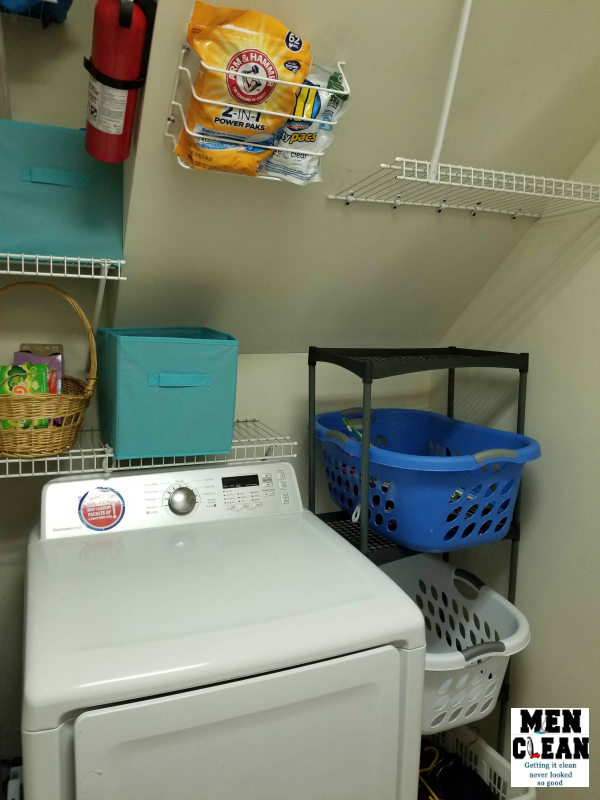 All laundry and mud rooms are not created equal, for our readers – you may have your washer and dryer upstairs, in a closet, or maybe in the garage area. We implore you, to think about where you are storing these packets. Are they accessible to youth and pets? Detergent packets need to be kept UP, CLOSED, and SAFE from little ones. Always keep product containers securely closed before, during and after usage. I know, convenience and expediency is all we normally think about when it comes to doing laundry. As responsible adults, we need to ensure with convenience we do not compromise household safety. We can not be complacent in relying on the LLP manufactures to keep our laundry room safe. Many LLP manufactures use robust child-proof slider enclosures as a means of prevention. I see this a good line of defense, however, we must over-emphasis a guardian’s accountability to place the LLP product away from a child’s environment using height mechanism (out-of-reach) and shutting enclosures (cabinets or storage bins). Laundry ease should not come at the expense of child safety. The American Cleaning Institute, as well as the cleaning products industry, is constantly educating parents on the importance of proper use and safety of the liquid laundry packets. Labeling, packing and new standards of child tamper proof enclosures in LLP packing are part of this increased safety awareness and accident prevention. Please help reduce the number of accidental children liquid laundry packet (LLP) exposures in your neighborhood. 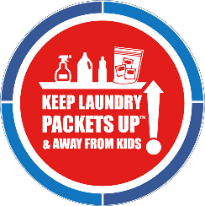 Go to packetsup.com for more information and tools to help you prevent exposures from liquid laundry packets. You can also enter your details to receive a free reminder cling – parents should place it in a visible location to serve as a daily reminder to store laundry packets up and away from children. And, follow #PacketsUp on Facebook and Twitter to keep up to speed on the latest in laundry room safety habits. Until next time, if you are like me, you look forward to doing laundry after a long day at the office – but please – subscribe to a Packets Up philosophy the next time you handle your detergent packets!